vibrancy of Haitian art, music, dance and culture with you! DANCE, MUSIC, FOOD & CULTURE! RASANBLE! Haitian Arts & Culture Festival 2018 would like to thank our Community Partner, AKONADI Foundation. RASANBLE! Opening Night Party is made possible with their generous support. Mbele is a premier folkloric Afro-Cuban music ensemble, based in Oakland, and directed by local Cuban-American musician & visual artist, Pablo Soto Campoamor. 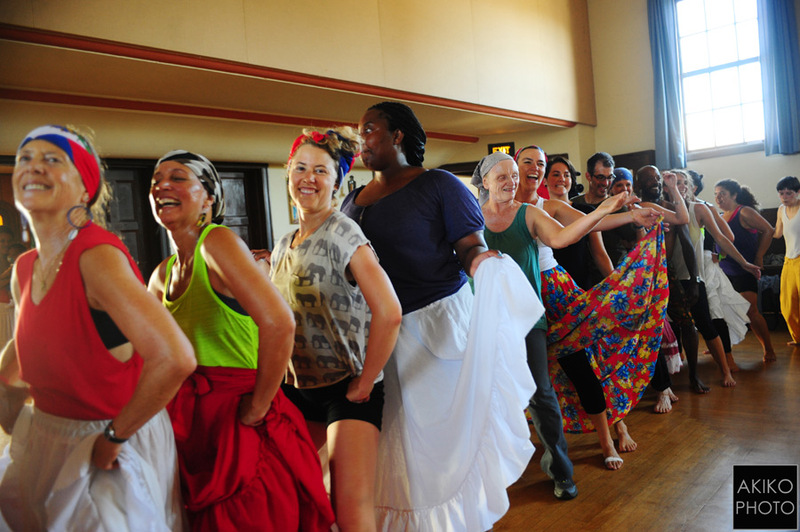 The group is comprised exclusively of musicians, and dancers from Cuba, and other parts of the African Diaspora. Mbele specializes in the traditional music (and dance) of the various African-based expressions in Cuba. Their repetoire includes ceremonial music of the Lukumí, Palo Kongo, and Arará, as well as popular forms like Rumba, and Conga de Carnaval. The word RASANBLE in Haitian Kreyol, means “to gather” or “to assemble.” Our goal is to gather dancers, musicians, community leaders, scholars, political activists, dance and music educators, linguists, cultural and food enthusiasts and supporters of Haiti to celebrate, make visible and inform participants of the rich cultural traditions that are the foundation of Haitian culture. ​We believe that the ultimate impact of RASANBLE! Haitian Arts & Culture Festival will extend beyond the stage or dance studio. 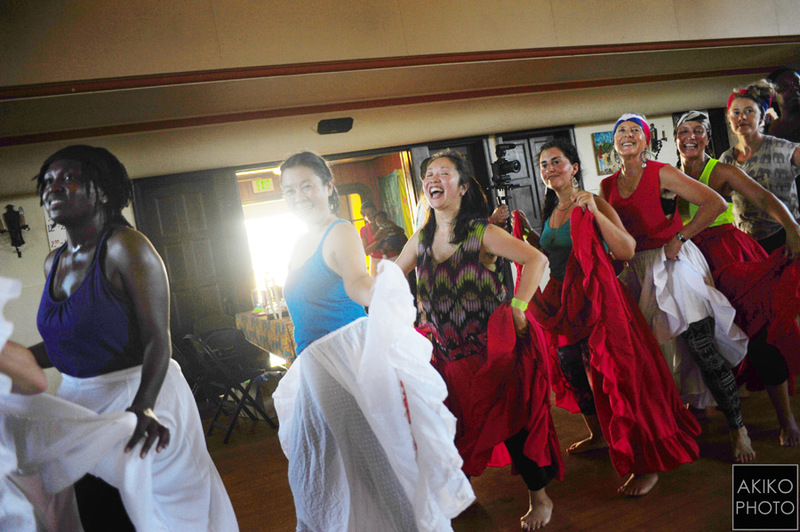 Our ultimate goal is that the cultural and creative exchanges with these folkloric artists will enrich and inspire new, creative, and thought provoking works in the Bay Area and other respective communities. 1970 Chestnut Street @ University Ave. Learn some of the basic elements/characteristics of Veve. Practice drawing the Veve for your favorite Lwa and create a mock Vodou flag. Participants will receive an introduction into the music of Haiti. 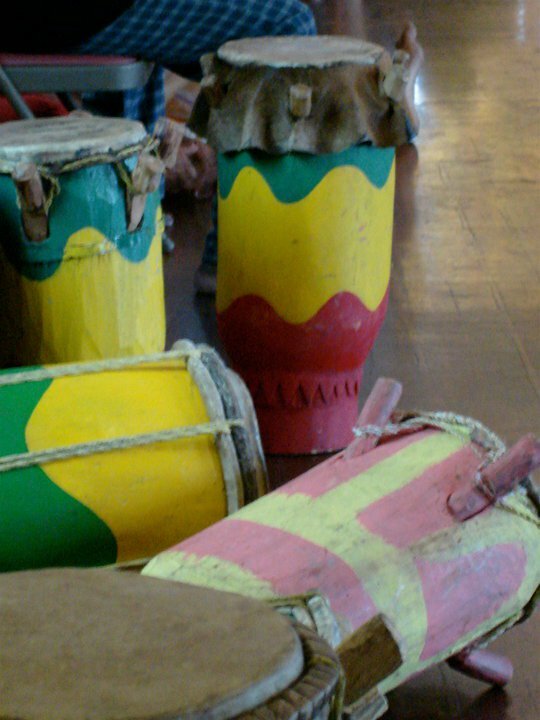 Learn basic techniques, and insight into how these rhythms and songs accompany Haitian Folkloric dance. Mr. Brevil is an accomplished drum teacher, leading classes and workshops for youth and adults worldwide. He exemplifies a unique insight into the relationship between dance and drum, which informs his compositions, arrangements, performances, and teachings. Mr. Brevil also conducts TRINITY, a weekly drum, song and dance workshop that demonstrates the intergration of these 3 forms in traditional Haitian culture. 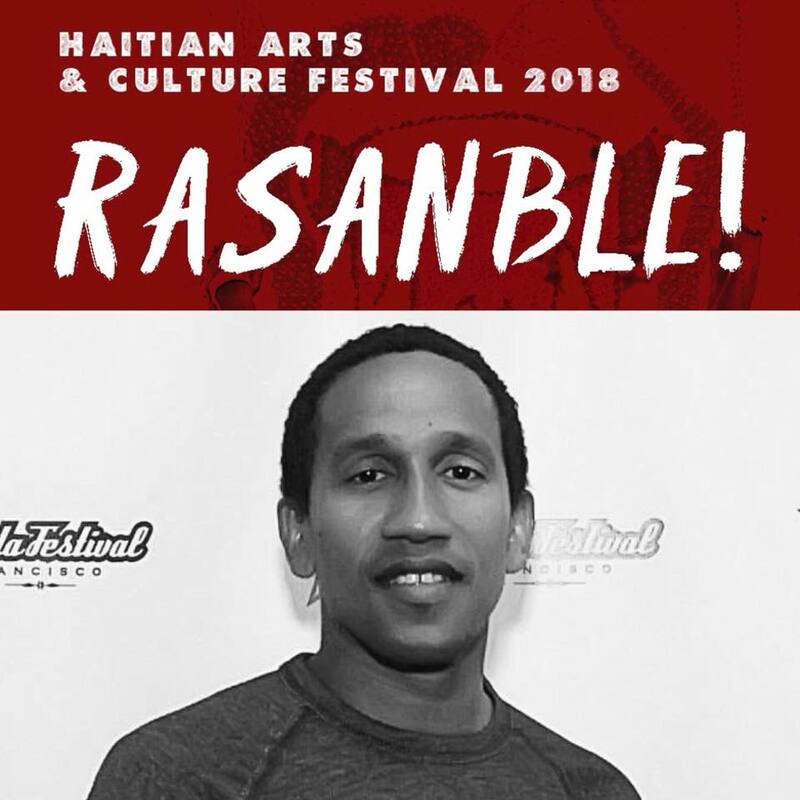 Jean-Sebastien Duvilaire (Baba-Seb) is a Houngan and Haitian Artist who strongly believes in the use of the performing arts to trigger social change. He has trained in African and Afro-Haitian performing techniques, as well as in classical ballet, modern and contemporary dance. Sebastien has worked with many artists internationally, and travels to teach, choreograph, and collaborate with artists throughout the U.S., the Caribbean, and West Africa. He is the founder of the AfrikAyiti Project, and always wishes to promote Africa together with Haiti in sharing his culture where ever he teaches or performs. He recently moved to Boston, where he has been performing with JAE/Jean Appolon Expressions. Outside of JAE, Jean-Sebastien continues to teach and choreograph, pursue study of Vodou, and runs a small cacao processing company in Haiti called Tahomey. which employs and networks small scale cacao farmers in rural Haiti. 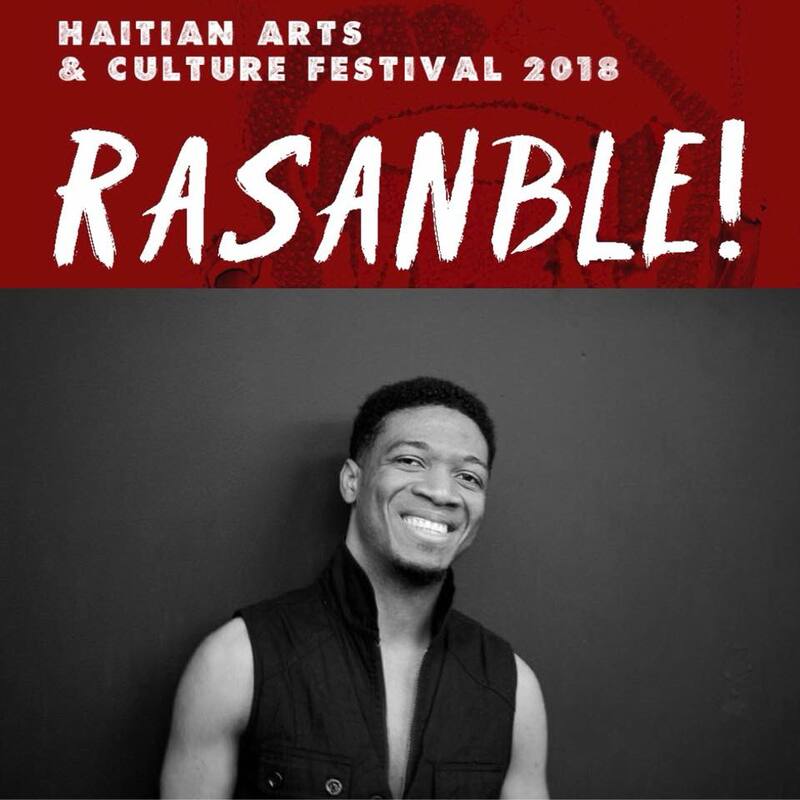 Born and raised in Port-au-Prince, Haiti, Pierre-Richard Leurbourg began his dance career at the age of 10, under Haitian Folklore teacher, Peniel Guerrier. Pierre-Richard developed his talent and skills as a young dancer and studied many dance styles such as Jazz, Ballet, Modern, and Salsa. At the age of 15, Pierre became a member of the Ballet Baccoulou Dance Company, Centre de Danse, and Tamboula Dance Company. ​In the 20 years with both Baccoulou Dance Company and Tamboula, Pierre-Richard traveled and performed in the Dominican Republic, Venezuela, Japan, Hungary, Miami, Canada, and New York. In Haiti, Pierre taught dance classes in Enarts and the Centre de Danse. Since moving to New York in 2006, Pierre-Richard has performed in Kriye Bode and taught dance class at the Djoniba Dance and Drum Centre, Ailvin Ailey Extension, PMT Dance Studio, and the Ripley Grier Dance Studio. Dance is a major part of Pierre-Richards life and he continues to serve as an ambassador of Haitian Folklore dance. Originally from Guantanamo, Cuba, Royland is a founding member of the Havana-based dance company, 7 Potencias, an Afro-Cuban Folkloric dance and music ensemble. 7 Potencias is one of the most creative and acclaimed Cuban folkloric ensembles, both in Cuba and internationally. 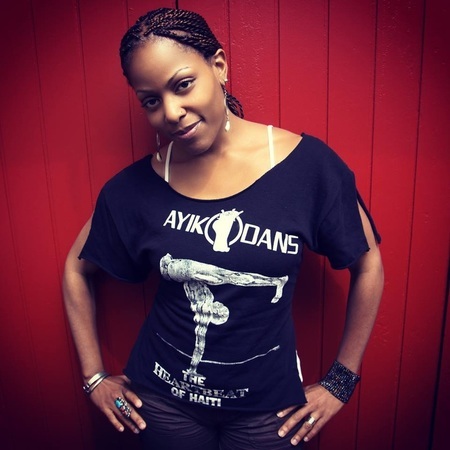 A professional dancer with an expertise in Afro-Cuban folkloric and Cuban popular dance, Royland has also participated as a principal dancer as well as instructor, and invited guest in performances, workshops and classes throughout the greater Bay Area, Hawaii, New York, Cuba, and Mexico. Sandrine Malary is a Haitian artist, designer, dancer, mother & lover of life! 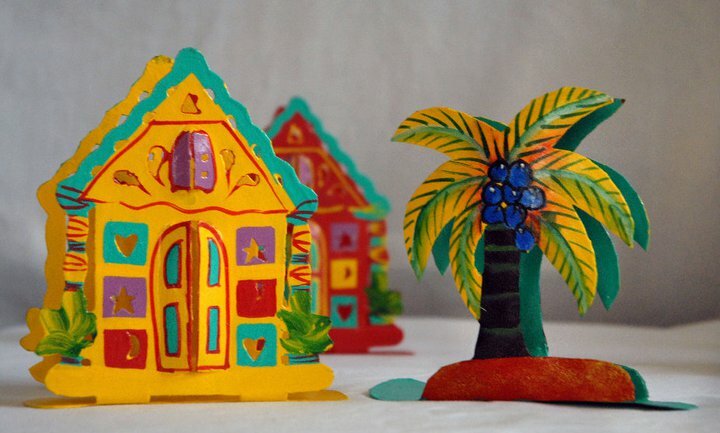 She is an artist who specializes in Haitian themes and the use of recycled materials. 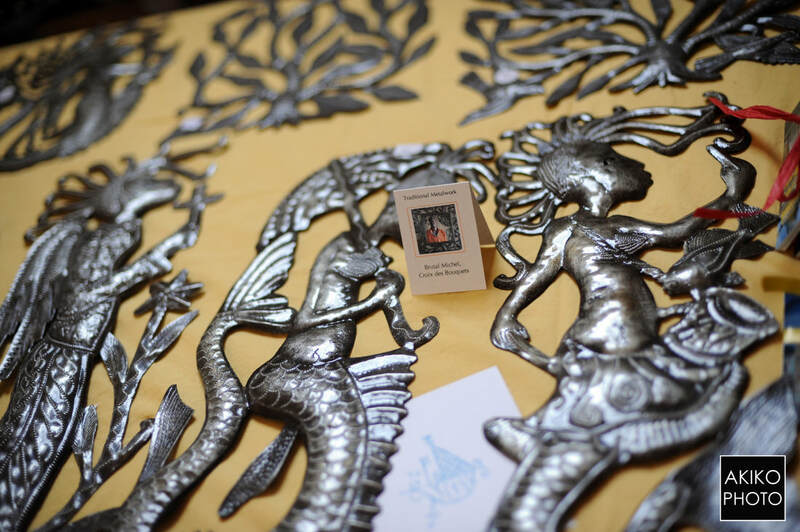 Her Oakland/Haiti-based, custom creative arts business, Alouba, is currently gaining recognition in the domain of up-cycling. Alouba creates everything from funky red carpets and lamps to original costuming, pinatas to up-cycled jewelry. Her goal is to create things of beauty from recycled, organic or natural materials. Alouba makes every effort to maintain harmony with the planet and educate others on different ways that can be done. Ms. Malary is also a dancer, having performed in the San Francisco Ethnic Dance Festival, currently dancing with Rara Tou Limen and more. She is an educator, homeschooling children since 2005. Sandrine remains active in supporting her homeland’s forward progress through organizations like Ayiti Resurrect. 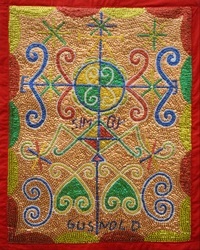 The exploration of Vodou and Afro-centric themes dominates her artwork. Her pieces contain veve and lwa symbology. 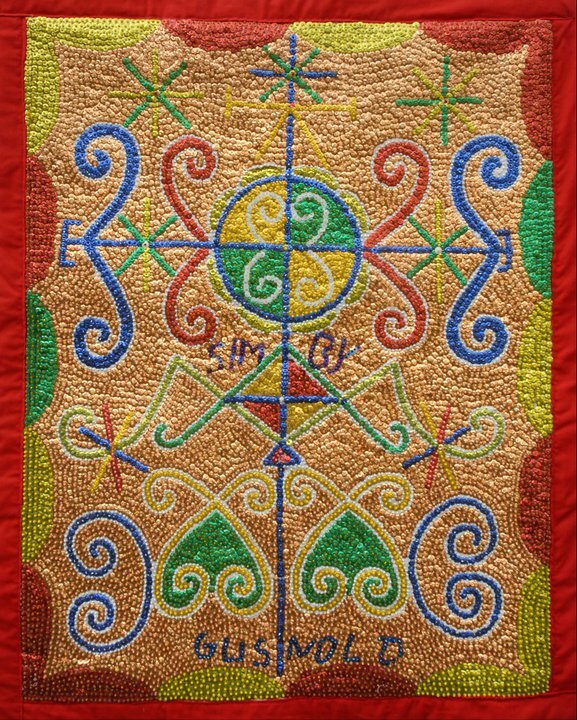 In her current body of work she explores texture through mixed-media layering while maintaining Haitian vodou culture as the focus. The intention of Sandrine’s creative process is to serve as a reminder of the beauty and majesty of her Haitian lineage by way of the mandala like veve. 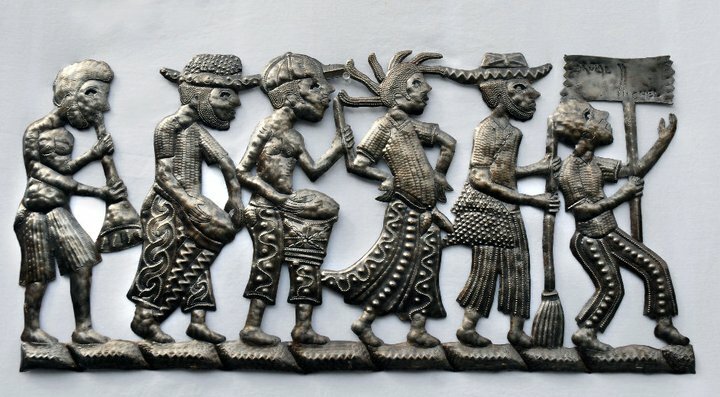 Among the members of the Palo Kongo society, in Cuba, the word "Mbele" signifies "machete, knife, or blade". Paleros regard the mbele as a sacred tool. In the classic Kongo philosophical sense, the blade represents a fundamental truth, or principle of life and energy. The mbele is an ordinary tool. Energetically neutral, it has no inherent strength, and cannot act indepently. It requires our hand, and purpose. Thus, it has the ability to heal or harm. The tool is only an extension of the soul that wields it. This is true of energy in ANY manifestation. Unsurprisingly, this tool became potent symbol for liberation, and self-determination, for Africans in Cuba, and their decedents. As an ensemble, we take the Mbele as an emblem of cultural resistance and celebration. Our Mbele is the blade of truth, and revolutionary thought. It stands for our common struggle against injustice, and hate. This machete is the sound of our social, spiritual, emotional, and cultural empowerment. And, as always, the Mbele is a symbol of unity, and solidarity for ALL people of the African Diaspora. Pablo Soto Campoamor's latest project is LA FANMÍ: An interdisciplinary research and performance project, originally concieved by Angel Yoel Mulen-robert, Pablo Soto Campoamor & Portsha Jefferson. 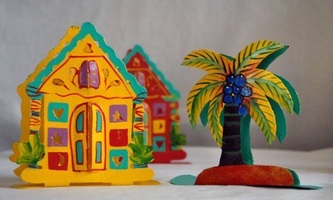 Bringing together the rich Haitian traditions of Eastern Cuba (Guantánamo in particular) with their equivalents in present-day Haitian folklore. Established in 2004 by Artistic Director Portsha Terae Jefferson, Rara Tou Limen has continually offered Bay Area residents, as well as people from all over the United States, the opportunity to experience Haitian music, dance and culture through classes, workshops, performances and educational events in both the United States and in Haiti. Our mission is to educate audiences about the richness of Haitian culture through artistic expression, while building and enhancing working relationships with other Haitian cultural groups in the U.S. and Haiti. 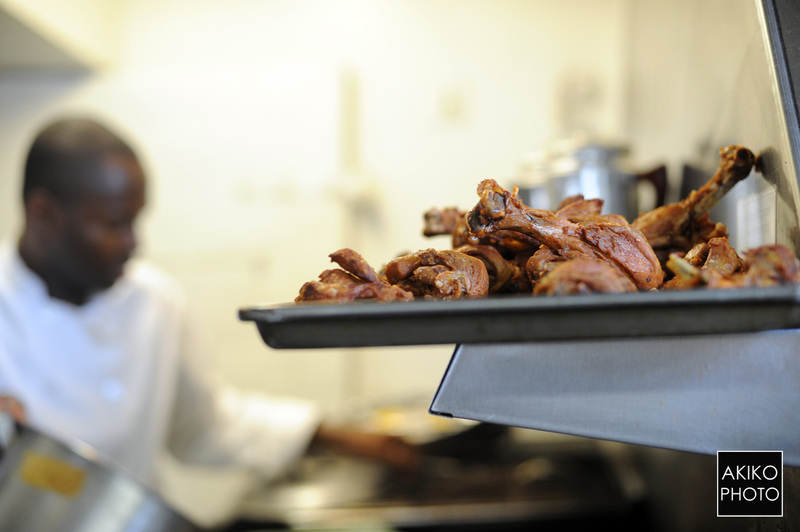 The company is carrying on the long legacy of creating strength and solidarity within the Haitian community, while actively raising awareness (and funds) for Haitian organizations. In celebration of Rara Tou Limen’s 10th Anniversary, the dance & music ensemble traveled to Haiti (August 2014) for a two week adventure! Company members participated in folkloric dance workshops at Ecole Nationale des Arts (ENARTS) with celebrated instructors, and visited natural and historical landmarks to investigate and research Haitian cultural traditions. In addition, RTL presented their full-length artistic offering, Limyè pou Ayiti... Lavi Kontinyè! In 2016, the company traveled to Montreal, Canada to perform in TWA, an artistic collaboration with celebrated Haitian dance companies, Mapou Ginen and Sole Danse Traditionnelle Moderne, celebrating the 225th anniversary of Bwa Kayiman. in 2017, Rara Tou Limen embarked on a cultural exchange to Havana, Cuba to participate in a dance intensive program that focused on technical training in Afro Cuban dance styles, Yoruba/Lucumí traditions and Cuban-Haitian traditions. Most recently, company participants traveled to New Orleans to research Street Festivals and Performance, and the cross-cultural influences of Second Lines in NOLA and Rara Bands in Haiti. Ansanm Tanbou Trinite is a Haitian folklore ensemble, under the direction of master drummer Daniel "Brav" Brevil. Brav learned his craft at the feet of his father, Joseph Brevil, a respected master drummer, Vodou priest (Houngan) and community leader, who worked in the neighborhoods of Port au Prince, Haiti. Formed in 2015, Ansanm Tanbou Trinite (which translates from Haitian Kreyol to "The Trinity of the Drums Together” presents traditional Haitian culture, within the context of current events in the San Francisco Bay Area, and beyond. The struggles of our Haitian ancestors have provided us with a legacy of strength and perseverance which we draw on today, to face the social justice issues of our times. 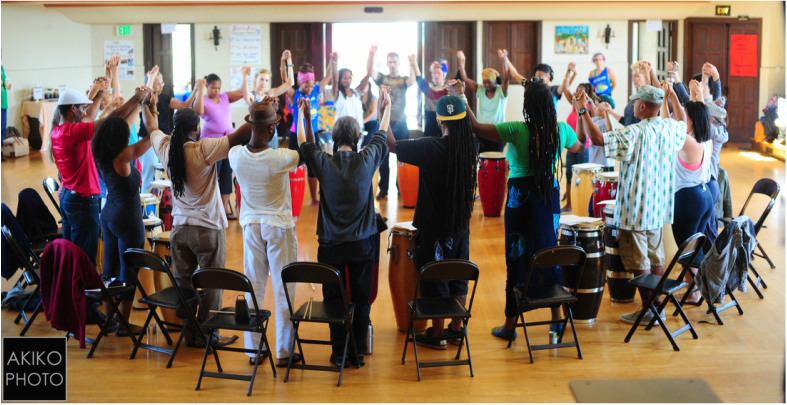 Police brutality, violence and racism plague our community, and with the recent deaths of Stephon Clark, Nia Wilson and countless others, our goal is to express the passion and power of the songs, dances and drumming of Haiti, and spread a message of hope, healing and empowerment. Portsha T. Jefferson | Producer, RASANBLE! 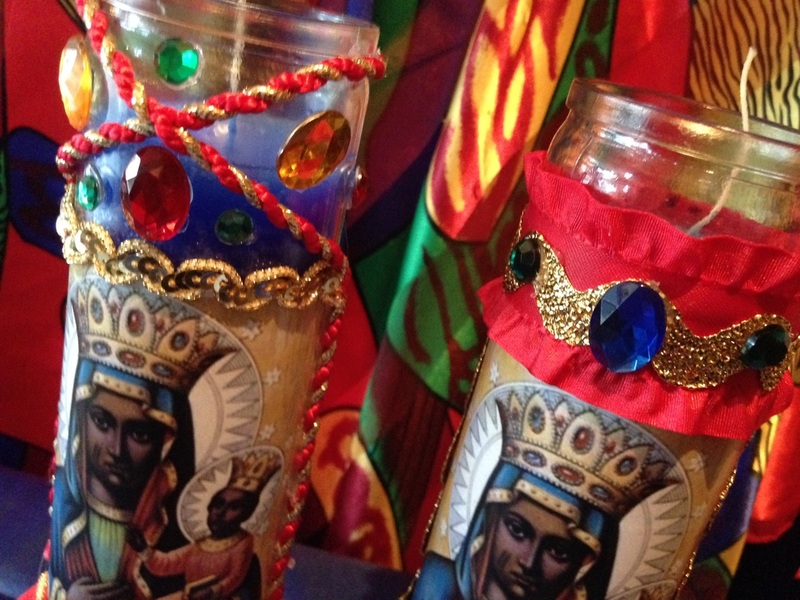 Vodou Inspired Candles made with LOVE! Created by Ashade Bon Manbo, each candle is handcrafted with a specific Lwa (spirit) of your choice. Set your intentions and feel the energy of Ashade Designs! Alouba's mission is custom creativity. We aim to help people express their creativity by producing for them what they envision. We take your creative ideas into our hands. Alouba also produces a retail line that changes with the seasons, so you never know what we'll come up with next! Dancers! Are you looking for a unique folkloric dance skirt? Regina M. Tolbert, head seamstress of R Michele Folklore Skirts will have an array of beautiful hand crafted creations for your dancing pleasure at RASANBLE! Natural and Organic juice made with LOVE! A perfect way to refresh and nourish the body after class! 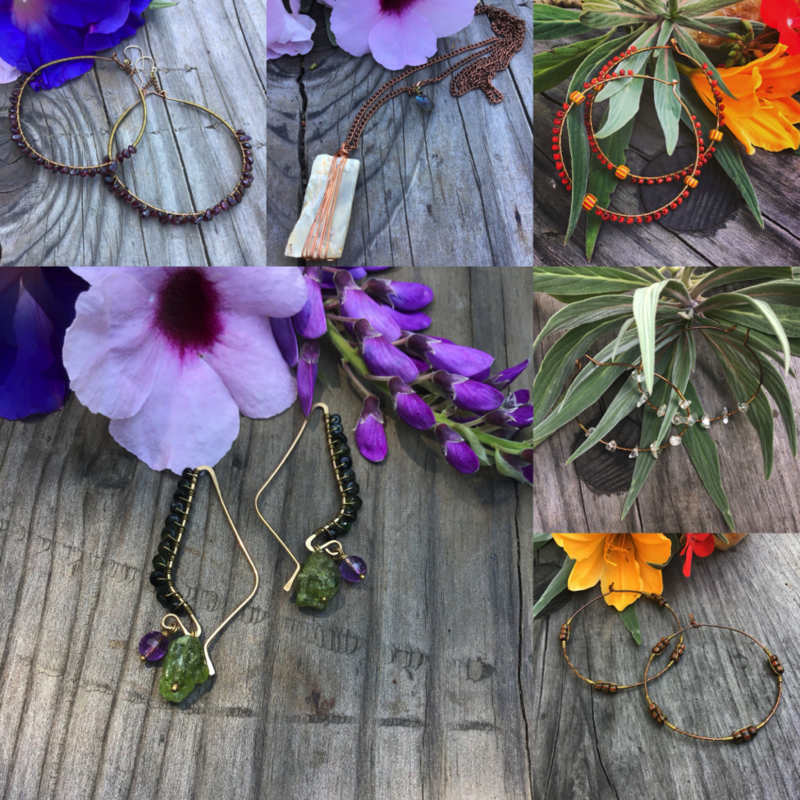 Regina Lynne is an elemental alchemist who designs therapeutic hand crafted jewelry and wearable art that is African Inspired and speaks to the Divine Feminine essence in every woman. She could combines raw uncut and faceted crystals and gemstones, fiber, metals, leather, imported/vintage glass beads from all over the world, with organics: shells, seeds, pods, wood, etc. As a Crystal Energy practitioner, Regina Lynne shares her knowledge of the healing properties of the stones so that the gemstone therapeutics become an extra bonus a buying incentive. Incense Gurl is a budding herbalist whom has been creating aromatherapudic products and unique handcrafted jewelery for 20 years. As I grow and expand in the culture of healing practices, also becoming a Full spectrum Doula, I seek to offer a way to help you facilitate a more in depth sensory and psychologically aware experience, as well as provide the simulating or relaxing medium, of your choice, one can use to attend to physical needs such as increasing oxygen to the brain the pineal, the pituitary gland, and influencing emotional and psychological states with specific essential oil combinations and botanical herbs. I thrive on the inspired creativity and the immense wisdom in the world of plants and animals, learning more about the body and how to support the relief of certain ailments spiritually and physically. We do hope you enjoy the things we've created for you. Art Matènwa (Atis Fanm Matènwa) is a longstanding grassroots women's arts collective based on the island of La Gonâve. 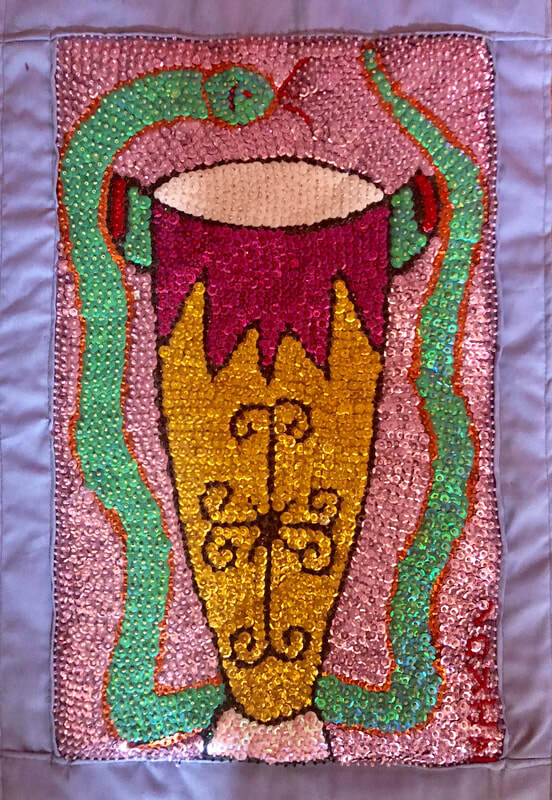 The Atis Fanm make detailed and skillful traditional and contemporary Haitian artwork - painted silk scarves, beaded/sequined drapo flags, embroidered tableaus, and printwork. The Atis Fanm work in collaboration with the Matènwa Community Learning Center, a progressive school that advocates for educating in Kreyol, the Mother Tongue, and emphasizes agricultural and arts trainings as well as women's and children's rights. Art Matènwa began over 18 years ago with 8 women from Matènwa, a remote mountain town of subsistence farming families. Embodying the principle that women are the "Poto Mitan", these 8 women formed a collective and partnered with American artists and educators to develop culturally significant art unique from other Haitian artisan products. Since then, the art center has expanded to include 38 Atis Fanm working in four mediums. Artwork made by the Atis Fanm mixes Vodou imagery with the flora and fauna of La Gonâve. Wanda Dabkoska, acupuncturist, herbalist, and owner of Kokoro Clinic, located in beautiful downtown Oakland, is passionate about educating people about the magic of acupuncture and Chinese Medicine. She provides gentle and effective care based on the values of non-judgement, self-compassion, and mindfulness. She received her Masters of Science in Traditional Chinese Medicine from ACTCM in San Francisco. She served at the Haight Ashbury Free Clinic providing acupuncture and herbs to at-risk patients and had a clinical rotation externship at the UCSF Neurovascular Disease and Stroke Center. Born and raised in San Francisco, she currently lives in Oakland with her partner and cats. Atreese of All Good Things Energetic Bodywork is a 6-year MT, with certifications in Ra Sekhi (Kemetic Reiki), Trauma-informed yoga, Ma'Yoni'at Womb Yoga, and Sema Paut movement. 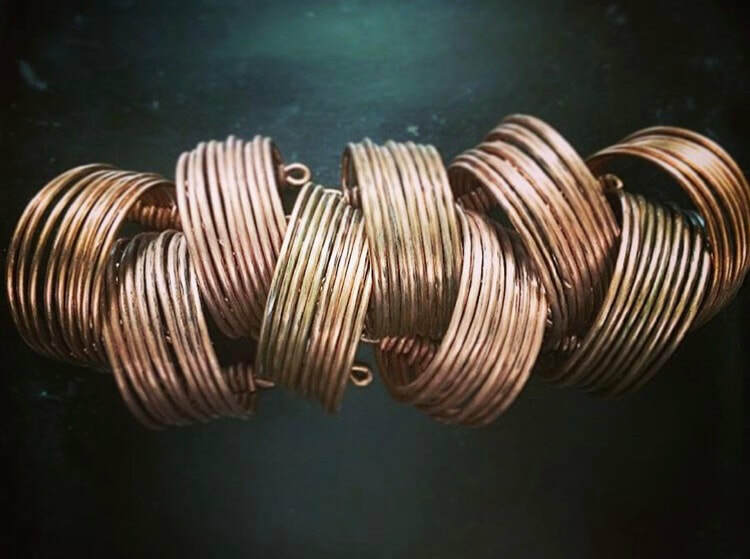 As an 8-year practitioner of African Traditional Healing Arts, her bodywork focuses on merging the rhythms of the internal Self with the harmonious aspects of one's external environment. Her favorite Ari (Chakra) is the Solar Plexus, and she has devoted her practice to helping every individual find their "Little Sun" in the form of self-care and self-restoration. This year, stop by the All Good Things altar for a free "Aura Spritz" or to check out this year's custom Altar Oil line- where Atreese will be providing rhythmic massage to the sound of the Rasanble drums, to release tension and stagnant energies kicked up during this sacred ancestral dance work. Tara is thrilled to be offering acupuncture services at RASANBLE this year! acupuncture for the first time. LUMINAE products are handcrafted with pure essential oils and charged with crystal stones, sound vibration, and healing energy. Essential oils have been used in traditional medicine for physical, emotional, and spiritual benefits. Each blend is a unique selection of plant medicines that support self care, alignment, and elevation. Essential oils are highly concentrated volatile aromatic compounds of a plant used in aromatherapy and topical application to facilitate wellbeing. Through smelling the chemical compounds of the plant, essential oils enter the olfactory system and directly activate the limbic system of the brain, which can have a profound effect on emotions, physiological functions, and spiritual development. Ivy Lee, MSTCM, LAc is the founder of LUMINAE. She is a licensed acupuncturist, herbalist, and energy worker with a spectrum of knowledge and experience across various therapeutic modalities. She specializes in treatments for women's health, fertility, pain relief, and stress management. She integrates traditional healing practices with modern scientific medicine. Her acupuncture practice is located in Oakland by Lake Merritt. Pierre-Richard Leurbourg is our resident chef for RASANBLE 2018! 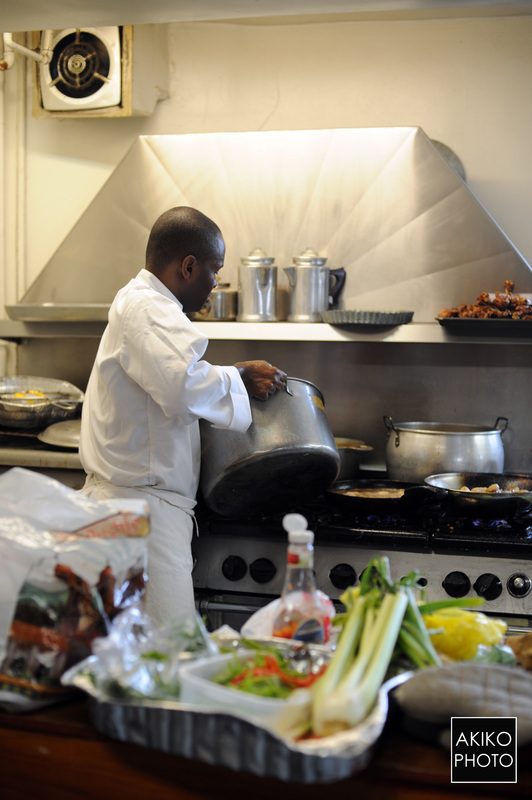 In addition to his Folkloric dance studies and training, Pierre also shares a love for food. Haitian food! 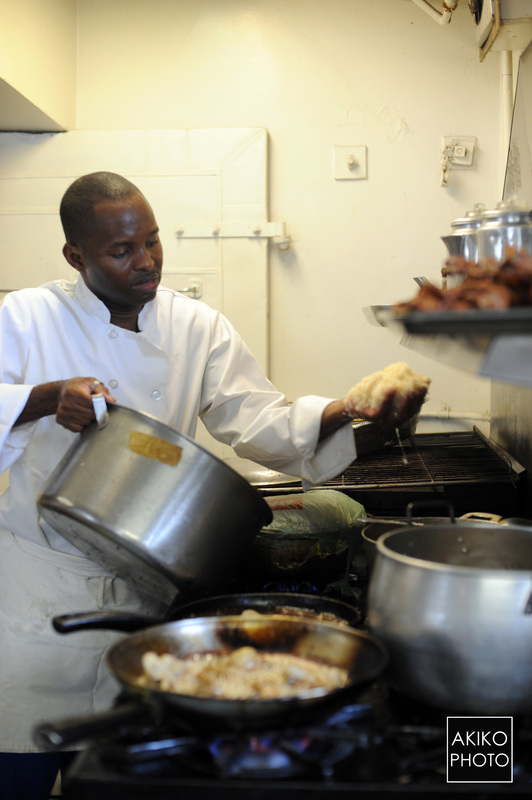 To further enhance his skills, Pierre attended culinary school in Haiti. Diri ak Pwa, Poul, Griyo, Lalo, Sos Ti Malis, Pikliz, and Bannann Peze. Performance, Vodou Presentation - FREE! RASANBLE! 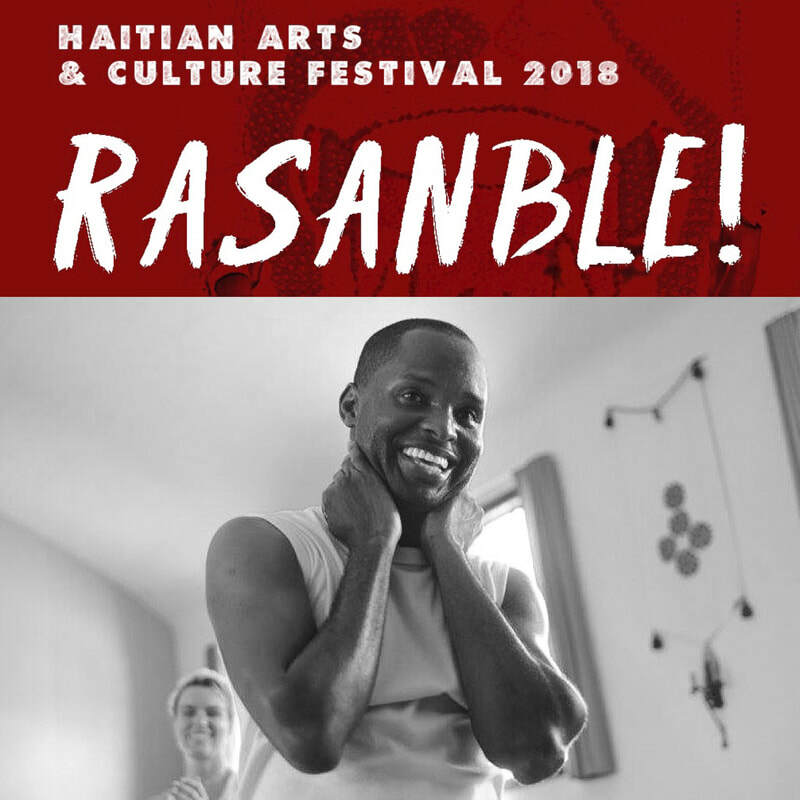 Haitian Arts & Culture is made possible with the generous support of Alliance for California Traditional Arts, Zellerbach Family Foundation, Everyday Magic, and The Hewlet Foundation. Rara Tou Limen would also like to extend a sincere and heartfelt THANK YOU! MESI! to our dance and drum community for your continuous and unwavering support in keeping Haitian culture alive and thriving in the Bay. Ayibobo!